Why Buddhism is True: The Science and Philosophy of Meditation and Enlightenment is a 2017 book by journalist and evolutionary psychologist Robert Wright. As of August 2017, the book had peaked at The New York Times No. 4 bestseller in hardcover nonfiction. 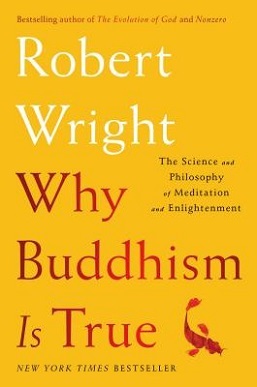 In Why Buddhism is True, Wright advocates a secular, Westernized form of Buddhism focusing on the practice of mindfulness meditation and stripped of supernatural beliefs such as reincarnation. He further argues that more widespread practice of meditation could lead to a more reflective and empathetic population and reduce political tribalism. In line with his background, Wright draws heavily on evolutionary biology and evolutionary psychology to defend the correctness of Buddhism's diagnosis of the causes of human suffering. He argues the modern psychological idea of the modularity of mind resonates with the Buddhist teaching of no-self (anatman). Why Buddhism is True received a number of positive reviews from major publications. A review in The New Yorker by Adam Gopnik stated, "Wright’s book has no poetry or paradox anywhere in it. [...] Yet, if you never feel that Wright is telling you something profound or beautiful, you also never feel that he is telling you something untrue. Direct and unambiguous, tracing his own history in meditation practice—which eventually led him to a series of weeklong retreats and to the intense study of Buddhist doctrine—he makes Buddhist ideas and their history clear." The neuroscientist Antonio Damasio, reviewing the book in The New York Times, stated that, "Wright's book is provocative, informative and, in many respects, deeply rewarding." Kirkus Reviews called the book a "cogent and approachable argument for a personal meditation practice based on secular Buddhist principles." Adam Frank, writing for National Public Radio, referred to it as a "delightfully personal, yet broadly important, new book." The Washington Post gave a more mixed review, stating that "while [Wright] does not make a fully convincing case for some of his more grandiose claims about truth and freedom, his argument contains many interesting and illuminating points." ^ Cowles, Gregory (18 August 2017). "A Science Writer Embraces Buddhism as a Path to Enlightenment". The New York Times. Retrieved 3 February 2018. ^ a b Illing, Sean (12 October 2014). "Why Buddhism is true". Vox. Retrieved 30 October 2017. ^ a b c "Why Buddhism is True: The Science and Philosophy of Meditation | Kirkus Review". Kirkus Reviews. Retrieved 14 December 2017. ^ Gopnik, Adam. "What Meditation Can Do for Us, and What It Can't". The New Yorker. Retrieved 30 October 2017. ^ Damasio, Antonio (7 August 2017). "Assessing the Value of Buddhism, for Individuals and for the World". The New York Times. Retrieved 14 December 2017. ^ Frank, Adam. "Why 'Why Buddhism is True' is True". National Public Radio. Retrieved 15 December 2017. ^ Romeo, Nick (25 August 2017). "Meditation can make us happy, but can it also make us good?". The Washington Post. Retrieved 14 December 2017.